The Outer Banks Woman’s Club is one of those organizations that seem to fall into the background, don’t get a lot of publicity but keep doing good works over and over again. These are the folks that that always seem to be ones who find ways to give to local causes like the Outer Banks Relief Foundation, the Beach Food Pantry and Food for Thought or the V.I.P Fishing Tournament that was just held. Now that it’s the holiday season they’re really taking it up a notch with their Annual Angel Gift Program that reaches out to local children who may not have gifts otherwise. It’s really grassroots funding which is what their Arts and Craft Christmas Fair is all about. 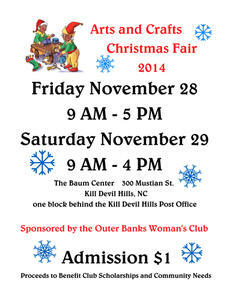 It’s coming up Friday and Saturday, November 28 and 29 over Thanksgiving Weekend at the Baum Center in Kill Devil Hills. Admission is only $1.00, proceeds go to making sure as many children as possible have something from that &ldquo;fat jolly old elf&rdquo;-that’s a quote from A Visit from St. Nicholas for those who have forgotten about the night before Christmas. The funds also go into a scholarship fund.